List of plants: Ceratophyllum demersum, Potamogeton sp., Eichhornia sp. 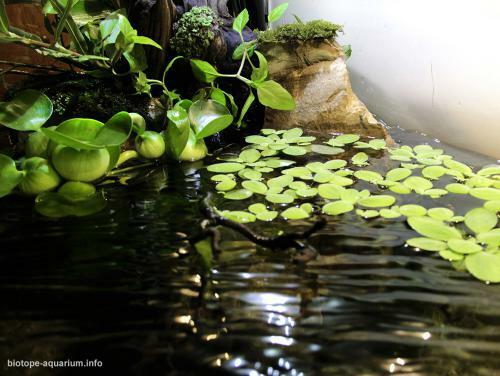 Biotope description: The aquarium was set up in order to draw public attention to the problem of endangered species of aquatic organisms and ecology of water bodies. By taking more and more natural areas, people pollute the environment, thereby displacing the representatives of fish fauna, leading them to extinction. One of examples is Ameca splendens, that previously inhabited the waters of the river Teuchitlan, Jalisco, in western Mexico. People settled near the river polluted its water, washed clothes in it, poured dirty water in it, grazed the cattle on its banks. 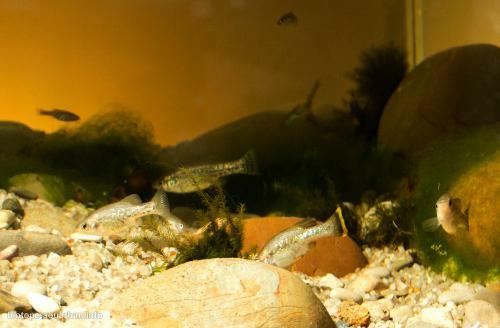 And now Ameca splendens does not live in the Teuchitlan river. Skiffia francesae also desappeared from this river. One more representative of Goodeidae is endangered: Zoogoneticus tequila, who lived in the same river. I will describe in detail the habitat of Ameca splendens (Cyprinodontiformes, Goodeidae). It lives in the upper reaches of the river Teuchitlan, a tributary of the Ameca River. This place is on the east edge of Teuchitlan at an altitude of 1311 m (4300 ft, 20°38’N, 103°45’W). The river Teuchitlan previously had clean warm shallow waters with weak flow. There were silt, sand, gravel, rocks and boulders on the bottom. Along the banks of the river there are trees, but there is not much driftwood in the river. In it there is a lot of rounded stones, covered with thread algae and diatoms (mostly Ulotrichales, Zygnematales and Oedogoniales), which serve as food for Ameca splendens and other inhabitants. 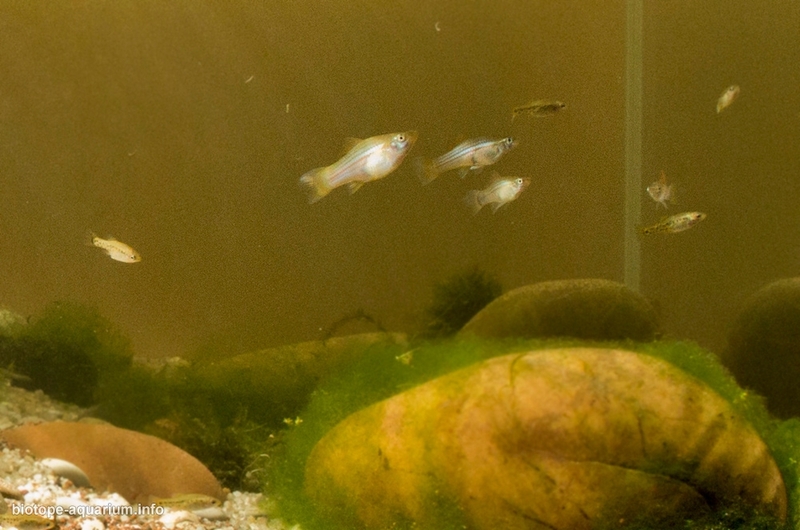 Besides plants Ameca splendens feeds on insects and invertebrates that fall into the water. The plants that grow close to the shore in areas with slower currents are Ceratophyllum demersum, broad-leaved Potamogeton, Eichhornia, and Fissidens fontanus, Pistia stratiotes are found, on the land near the water Acmella repens can be found, common in Mexico. 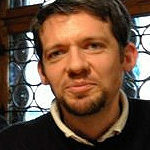 In addition to these aquatic organisms, Robert Rush Miller mentioned in the river Teuchitlan also Xiphophorus maculatus and Xiphophorus helleri, and the snail Pomacea flagellata flagellata is also found there. Now Ameca splendens is bred by hobbyists, and this species was recently found in the Valley of Sayula, and the problem of modern people is to avoid the same fate like the one of the river Teuchitlan. 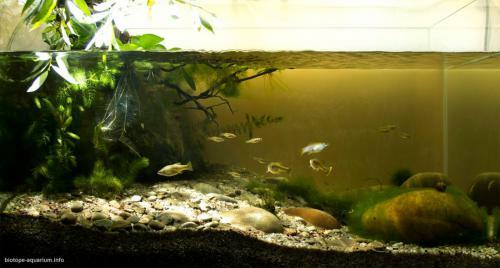 Another Mexico biotope! I love algae covered stones! Showing local biotopes and teaching people how important it is to protect them is very praiseworthy. Keep up the good work! Another tank with very good bottom, composed of stones and pebbles of various sizes. Algae growing on some of the stones add a lot to the natural feel, yet still the tank looks very clean. I put this entry on the 2nd palce. Here everything also looks realistic and natural. It would be nice to add fine sand. This is just a recommendation. Bright and natural, this is an accurate representation of a transitional zone between the banks and more open water areas – as reflected in the algal growth on the cobbles in the open areas. The appearance is quite natural and the fish species occur together in nature. Attention has been paid to recreate the shoreline as well with tangled roots and twigs with floating plants lodged among them. Also, the mix of substrate is done correctly with varying sizes of smooth pebbles and sand grains.